Our flight from Sydney landed about midday and we collected our luggage and headed out to the airport. A booth sold Go-Cards, the local public transport stored value card, so we got two of them and put $30 on them. The cards themselves cost $10 which was a deposit you got back when you returned the card and having a station at both Domestic and International Airports meant that we could get our money back as we left the country. Handy! The train into the centre of town was clean and not crowded at all, and we amused ourselves looking out the windows at the view as it changed form the brush and trees near the airport, to the sporadic houses of suburbia and then onto more built up neighbourhoods as we approached the city. Our first hotel was the Adina Apartment Hotel on Anzac Square – directly opposite the Central Rail Station. After lunching and then checking in, we headed out for dinner with my brother Anthony (Ants) and his family in Loganlea, a suburb an hour to the south. Interestingly Brisbane seemed to go from CBD to semi-rural suburbia without much in between. Maybe it was just the type of train we caught though (the Gold Coast line). My sister in law Lauryn made gluten free Kangaroo burgers which were delicious. I loved the DIY burger station – just add the bits you like. The ‘roo itself was a little denser than beef but very nice. 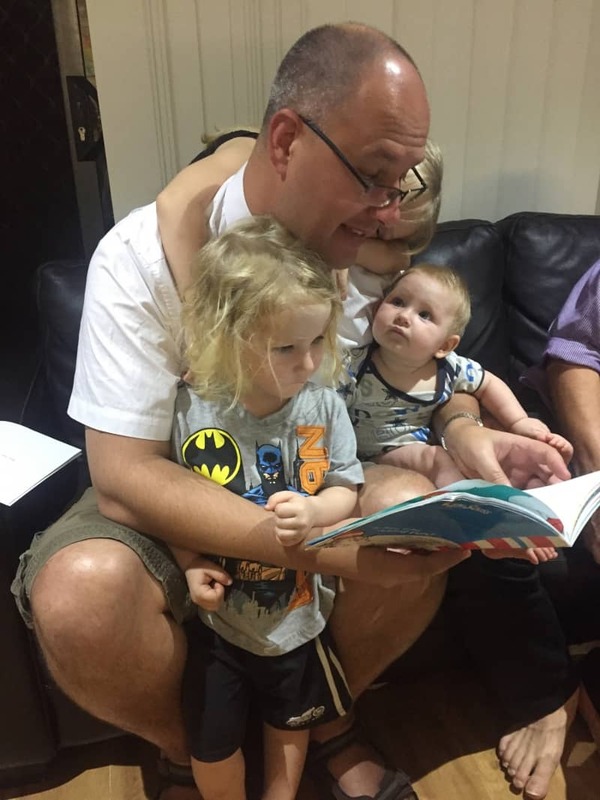 It was great catching up with the kids and they all loved it when I read them a good night story. Ants is also an avid traveller and Lauryn has a map in the wall to show the countries that they’ve been to – 84 at last count with an additional 4 coming up on their next trip. Lauryn has challenged him to get to 100 countries by the time he’s 40 – apparently they’re well on track. 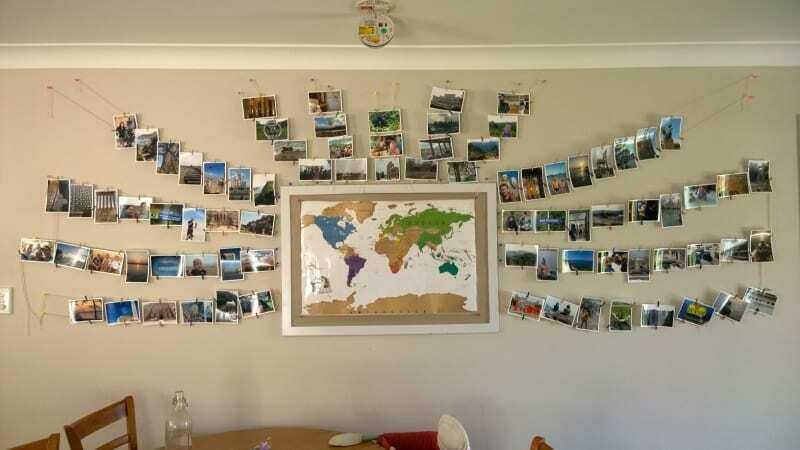 The map is surrounded by photos of the people they’ve met and the places they’ve gone to and it’s quite an impressive tribute to their travels. I’ve been lucky enough that our respective travels have coincided a few times, and make sure I visit them almost everywhere they’ve lived around the world. After the kids have gone to sleep and we notice that we’re starting to nod ourselves, we head back into the city via the train. Next day after checking in, we headed over to the Holiday Inn Express. Ange had some work to finish off so I made a nuisance of myself with the TV and stared out at the view. In the evening we headed out to the West End for dinner with friends of Angela’s. The West End sits behind the touristy area of the South Bank and every other shop seems to be a restaurant or bar. We headed back at a reasonable hour but the vibe on the street was that things were only just getting started! One of Ange’s friends drove us back to the hotel afterwards which was nice. 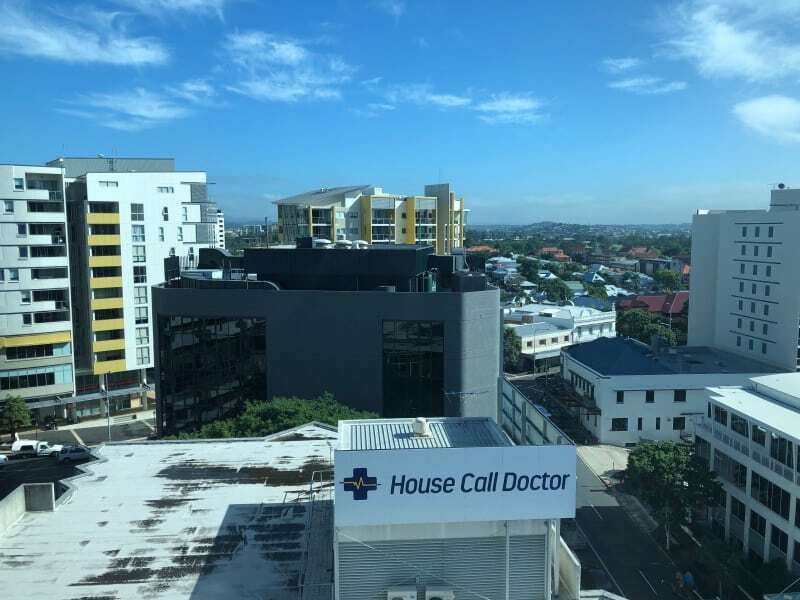 The next day we checked out of the hotel and headed into Fortitude Valley to have lunch with a friend of mine from school. Over ribs we interrogated Andrew on the must-sees in Brisbane. He frowned as he considered his answer. 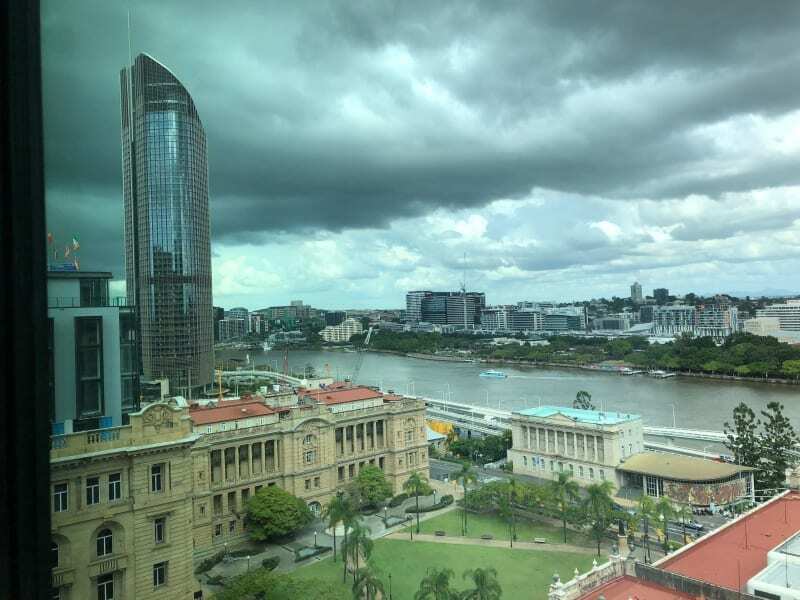 “Most people come to Brisbane to go somewhere else” he said eventually “usually up north to the Sunshine Coast or down south to the Gold Coast”. Surely there’re things to see in Brissie? we asked. 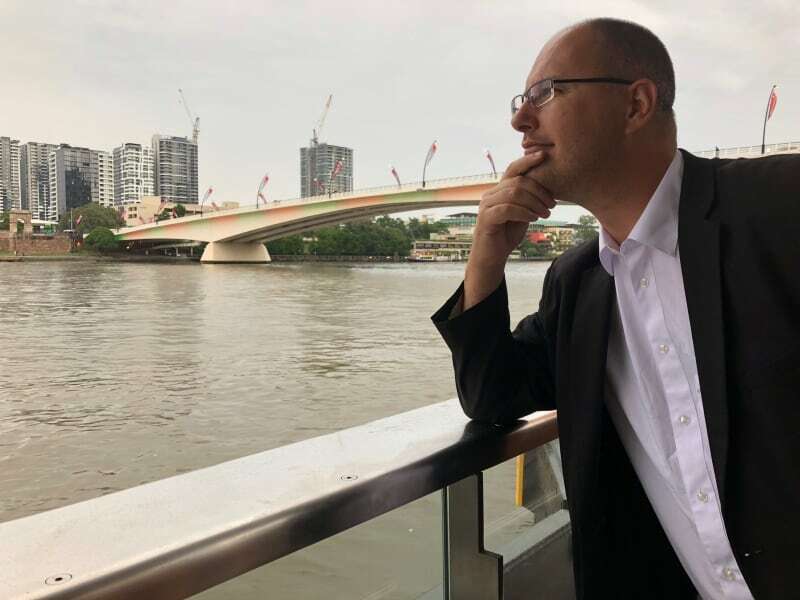 He mentioned a few things we could do and then suggested we meet him at New Farm Park the following night – free comedy at a hipster bar he knew in the old Powerhouse nearby. Hard to resist! 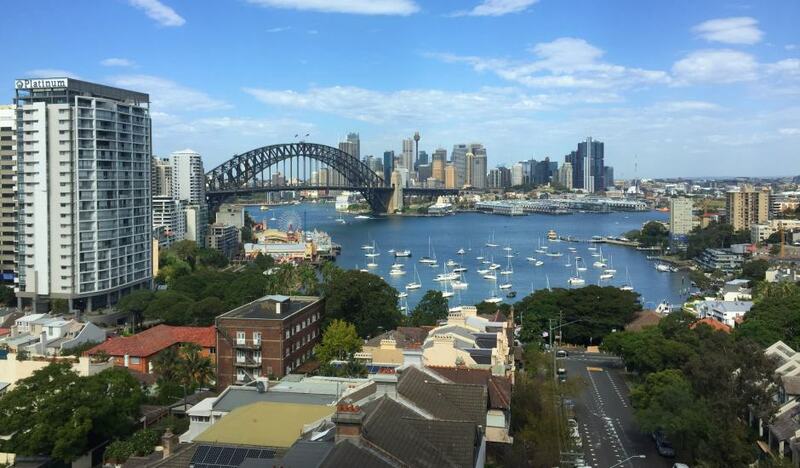 After returning to the hotel we Ubered to Il Mondo Boutique Hotel on Kangaroo Point and then looked around there. Night fell quickly – as you get closer to the tropics sunset is less a dragged out affair and more of an instantaneous transition from day to night: one minute we were admiring the orange sky over the Story Bridge, the next it’s pitch black save for the neon in the distance in the CBD and the street lights. It was the first night we weren’t catching up with friends or family, so after dinner at a local restaurant we just headed back to the hotel, and enjoyed the view from the balcony. 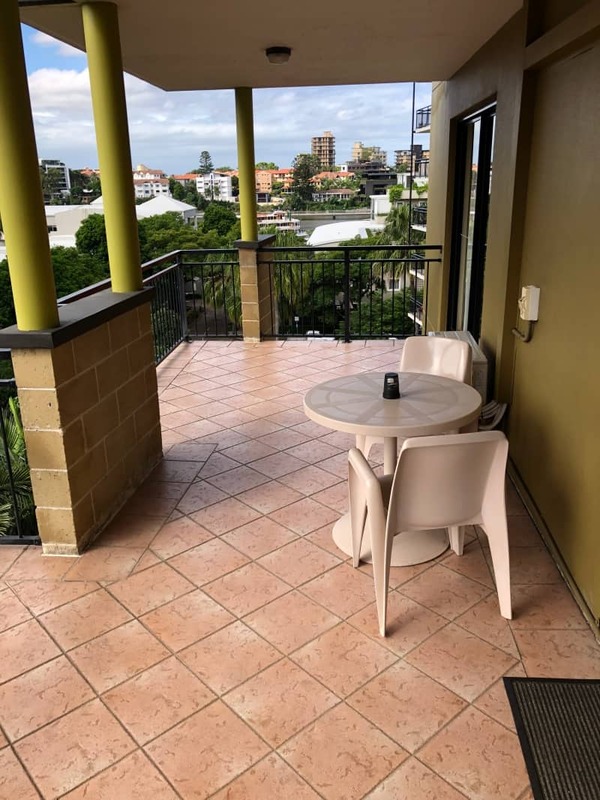 After checking out of Il Mondo, we headed across the river to the Ibis Styles Brisbane in Elizabeth Street for a two night stay. We checked in, dropped off our luggage and grabbed some food from a nearby food court and then came back to the hotel. The weather had been following a pattern of starting with bright blue skies, clouding by late morning with light rain in the afternoon, then clearing in the evening. Today was different though: by lunchtime the clouds had turned a darker shade than normal, and by mid afternoon the rain was coming down hard. And it kept coming. We’d arranged to meet Andrew at New Farm Park where the plan was that we’d throw the aerobie (a ring shaped frisbie-like object) around the park before heading to the Powerhouse for the comedy, and when the time came to head out the rain had paused, though the sky was still laden with heavy clouds. We walked the short trip from the hotel to the ferry station, one eye on the clouds. 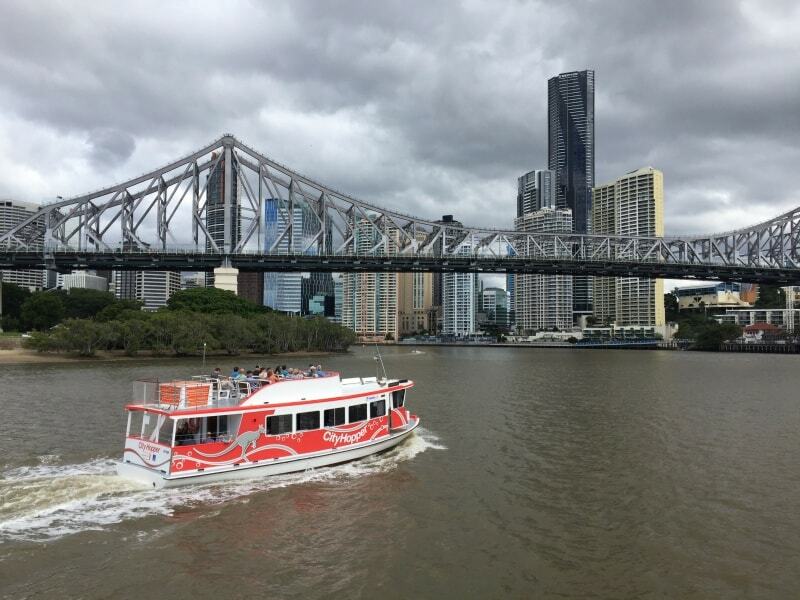 We took the free city hopper ferry to the park and as we got on the heavens opened again. We went from riverside jetty to riverside jetty hoping that the deluge would abait but all to no avail. We got off at our stop along with some other passengers and we all waited under cover in the vain hope that the rain would somehow abate. It did not. Eventually we decided that we needed to meet Andrew at the meeting spot and headed off under Ange’s umbrella. It wasn’t much fun both of us cramped under the same small umbrella, both affecting a very weird gait to ensure that we maximised the portion of our respective bodies that were under cover. Sort of like a drunk three-legged race. Anyway the rain had at least eased to a steady thrum from the tropical downpour by the time wed’d managed to walk through the very picturesque Merthyr Park and along Oxlade Drive to the entrance to New Farm Park. Andrew met us there, also a little damp from the walk from his car. 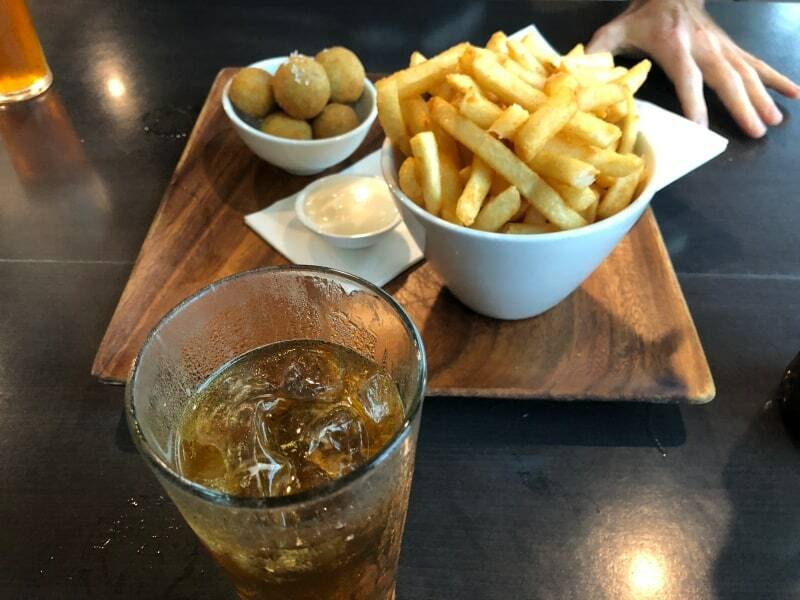 We bundled into his car and decided that instead of throwing a disc around in the park, we’d just head to the Powerhouse and dry out over a drink or three. Andrew was the consummate host, and didn’t allow us to pay for anything. 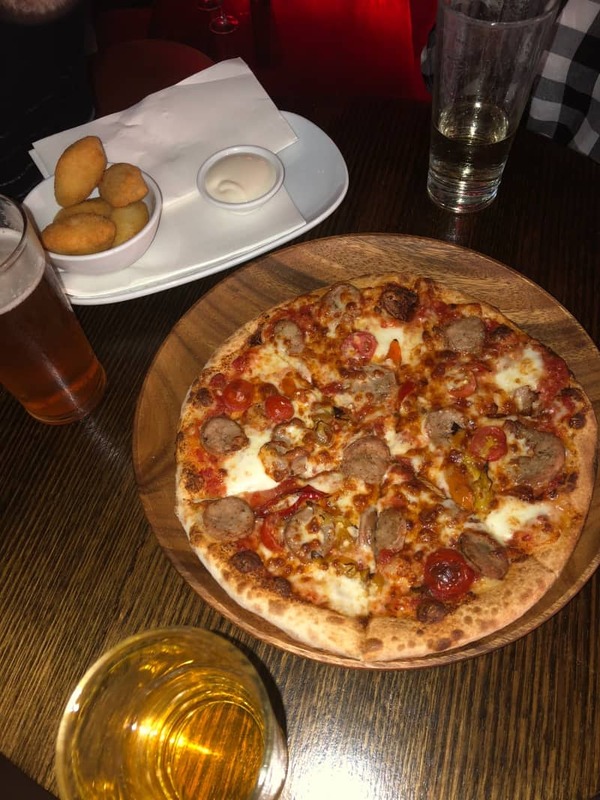 We grazed through some bar snacks and tried a few drinks while catching up on old times. Before we knew it, it was time to move to a different part of the complex and settle in for the comedy. Which was… worth what we paid for it. I don’t want to sound mean, but screeching about how hard comedy is does not entertainment make. Each act had maybe a couple of lines of mirth padded out to a fifteen minute slot and even the compere was finding it hard going. The headline act were good though – Release the Bees. A comedy duo in a similar vein to Flight of the Concords (I’m sorry – every musical comedy duo for the next 5 years will be compared to FotC), they made the night worthwhile. Or maybe that was the free food and drink and good company? Anyways, after the gig we went back to Andrew’s place to meet his partner and play board-games before Andrew dropped us back off into the City. 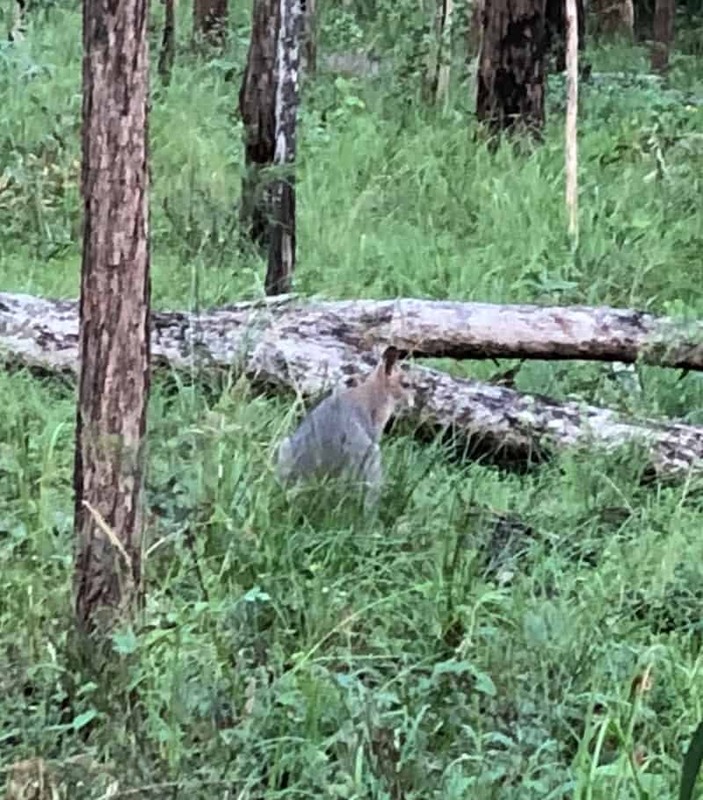 As usual the day dawned with better weather and once we had breakfasted it was time to go back South to meet Ants, Lauryn en famille and enjoy the Daisy Hill Koala Centre. 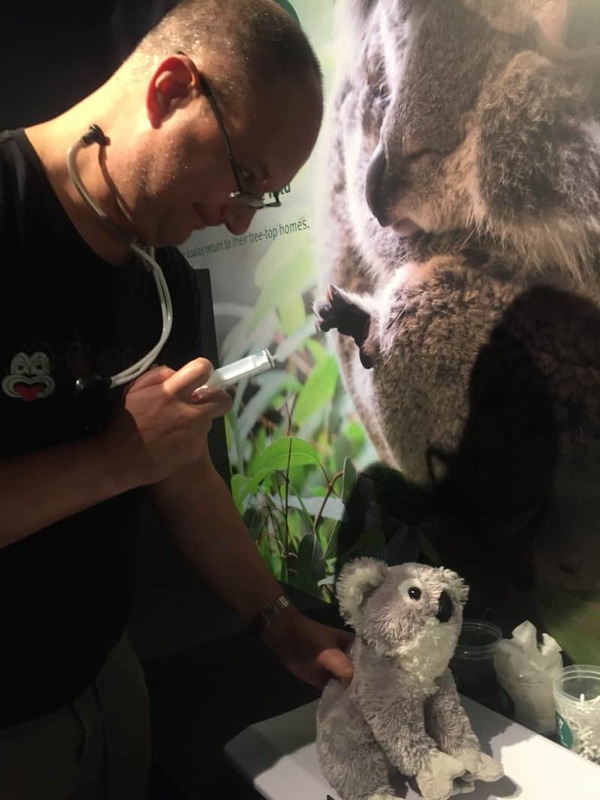 This is a free sanctuary for Koalas who have been run over or attacked by dogs and they nurse them back to health as well as using them as a resource for teaching conservation. 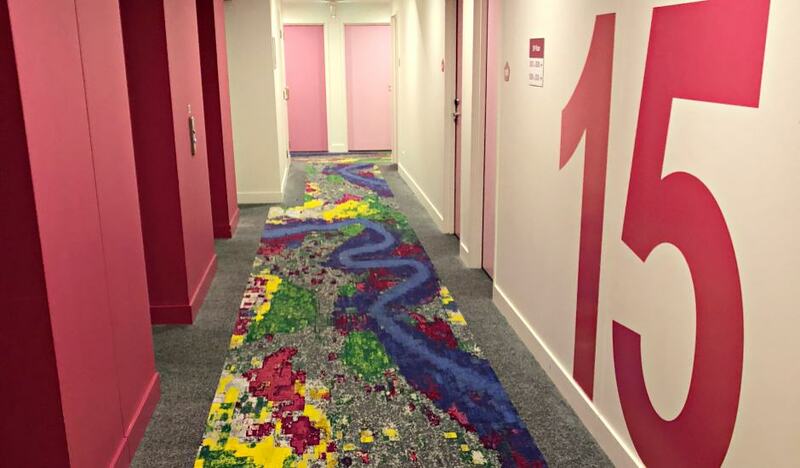 It’s a compact facility, squarely aimed at the kids with an opportunity to dress up and administer first aid on koala teddy bears, as well as a scatological exhibition entitled “Whose Poo?”. 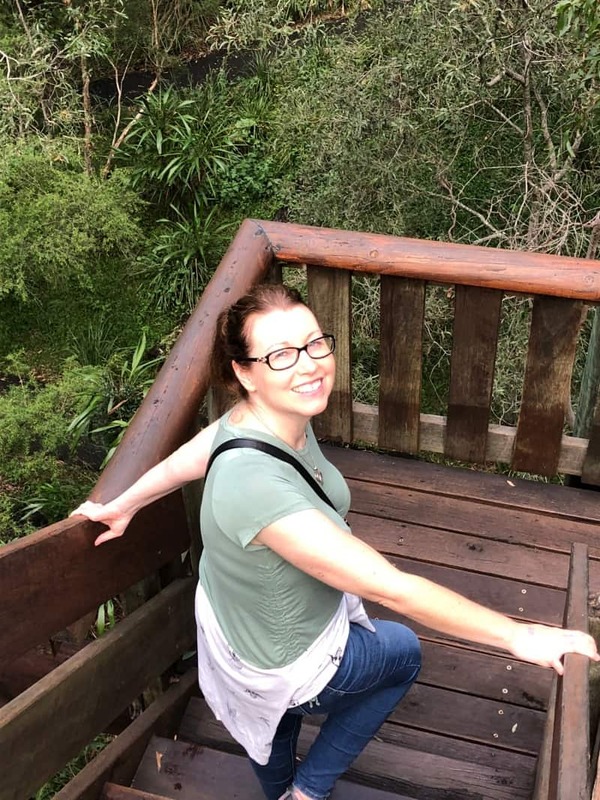 There’s an observation tower allowing views up into the tree canopy of the bush around the sanctuary, and on the way up it we could see into one of the offices where there was a human sized stuffed koala reclining in a chair. A little surreal. 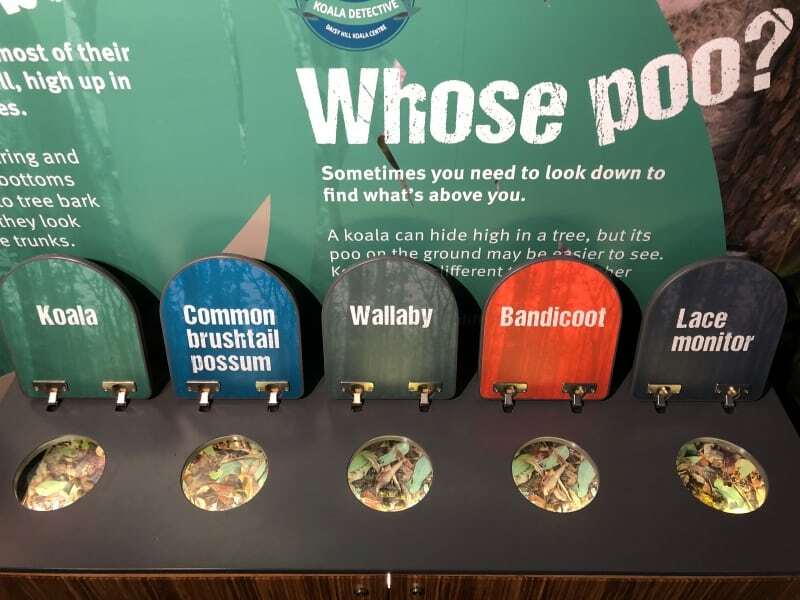 There’s also exhibits on some of Australia’s other animals and a movie theatre with some very interesting documentaries. 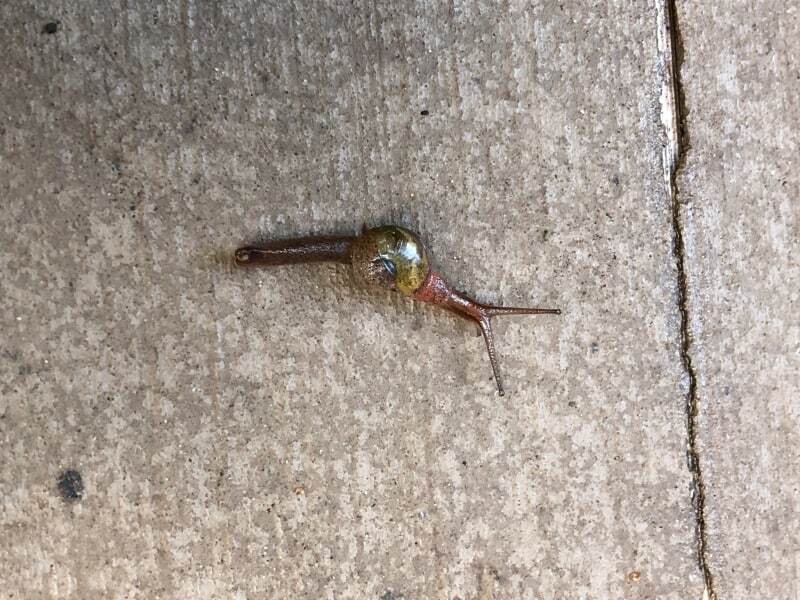 The sanctuary itself sits on a large reserve of natural bush and other animals can be seen in and around – we go for a walk and spot some weird snails with a disproportionate body to shell ratio, a kookaburra, a frog and even a wallaby (or it might have been a small kangaroo). Afterwards we head back to Ant’s and Lauryn’s for dinner. When they’d lived in Vienna, they had discovered a ribs place on the river called the Strand Cafe. Each time I visited them there we’d head down and marvel as the waiters would carry around huge boards of ribs – so heavy that they had to wear special wrist guards. The huge platter of delicious ribs had certainly set the bar high and I can’t help but compare all subsequent rib meals to them. One time I visited Ants & Lauryn and the Cafe was undergoing renovations – I almost turned around and got straight back on the plane. Anyway, Lauryn had decided to try her own take on ribs and had made her own rub and everything! They came out very well and the evening was a success. After dinner we headed back by train, getting off at South Brisbane station to walk across the Victoria Bridge back to our hotel. It was nice seeing the city all lit up. Our last day was the most touristy. We checked out and left the luggage at the hotel. 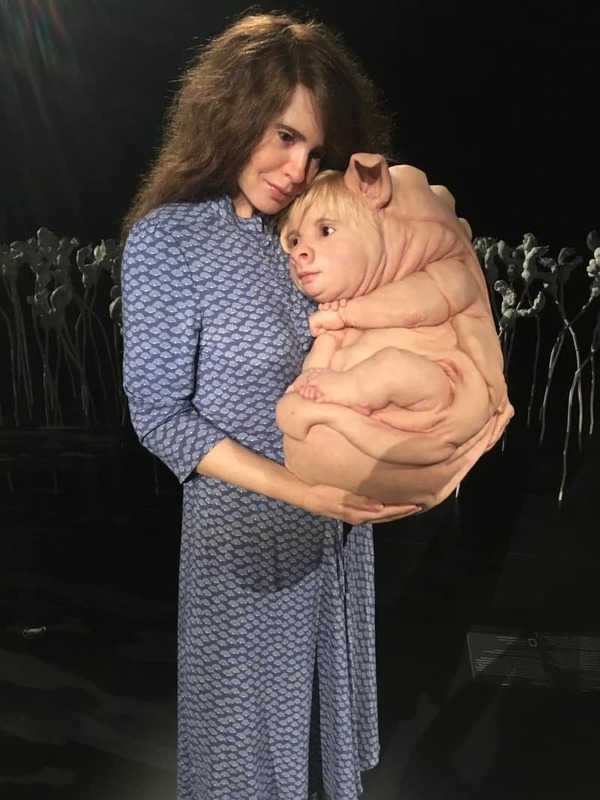 Then we headed over to the GOMA (Queensland Gallery of Modern Art) where there was a exhibition by Patricia Piccinini called Curious Affection. This cost $18 but was disturbingly good. The exhibition consisted of a large number of disturbingly realistic statues of… creatures. Sometimes there would be two figures, one a perfectly normal person/child and then another more grotesque. The interplay between the figures would always be loving or friendly, without any revulsion or other recognition of the “other-ness”. There’s something called the Uncanny Valley. This is a relationship between the realisticness of a thing and the emotions that are illicited from that thing. Basically a toaster doesn’t look human and therefore can just be treated as a machine. But as androids and robots get closer to looking and behaving like humans, there is a revulsion felt. The exhibition had reminded me of a statue I had seen in a museum in Washington, Ron Mueck’s Untitled (Big Man). I’d had my photo taken with it but it was a test of wills to stand beside it because it looked so real that I truly expected it to stand up or move of its own volition. 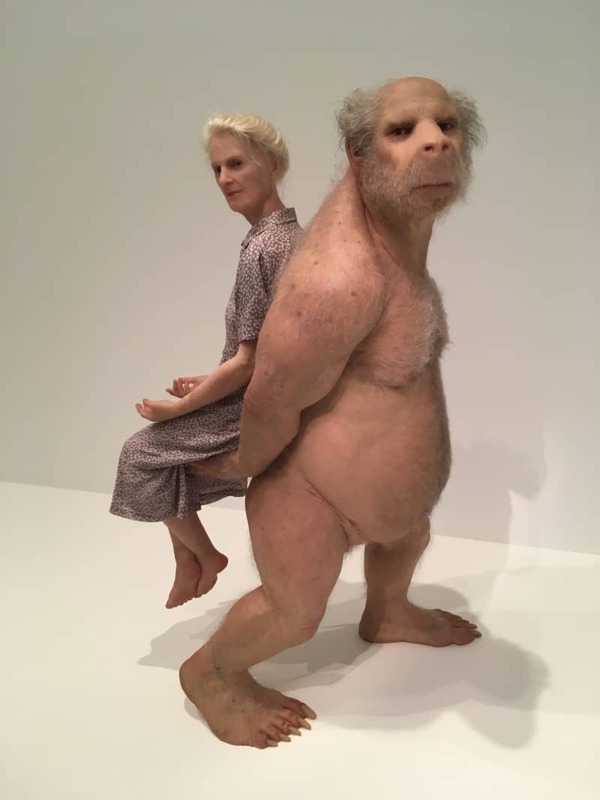 I’m not the first to draw parallels between the two artists – altogether too easy when they’re both Australians – but whereas Piccinini shows love when we expect revulsion, Mueck is more about exposing raw humanity by making the sculptures huge. Just my opinion anyway! Afterwards we thought about taking in more of the GOMA, but we instead headed out to get some bikes to ride by the river. This turned out to be harder than we thought. 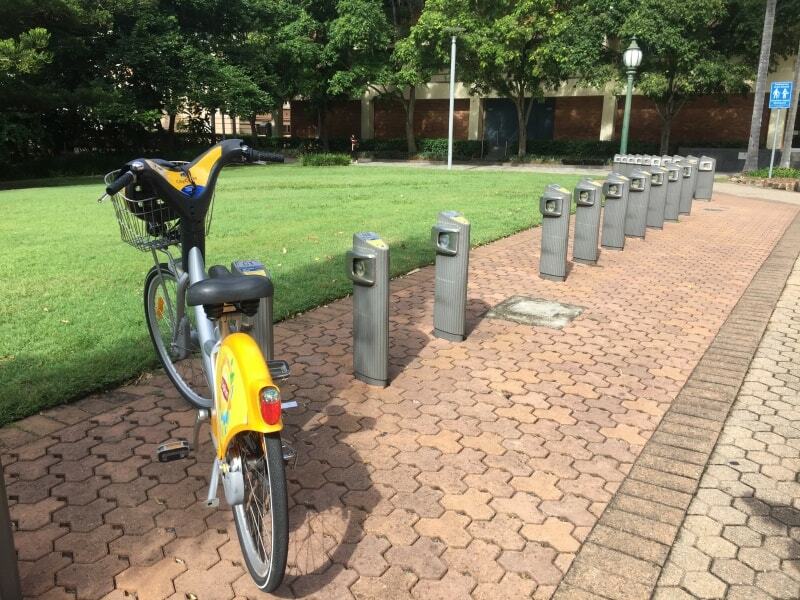 There are dozens of CityCycle stations around Brisbane where you can rent a bicycle (and if it hasn’t been lost, a helmet also) for a $2 membership fee. As long as you keep returning the bike within 30 minutes, you can effectively ride it all day for nothing more. And it’s only $2 if you happen to just miss the 30 minute mark. Unfortunately they’re incredibly popular, but fortunately each station will tell you where the nearest other stations are and how many bikes are available at each one. Unfortunately it doesn’t show a map so make sure you’ve got one! So the first station we went to only had one bike, despite the online website saying that they should have twelve. We navigated to the next closest station in the Botanical Gardens and there were two bikes there with helmets, so away we went. 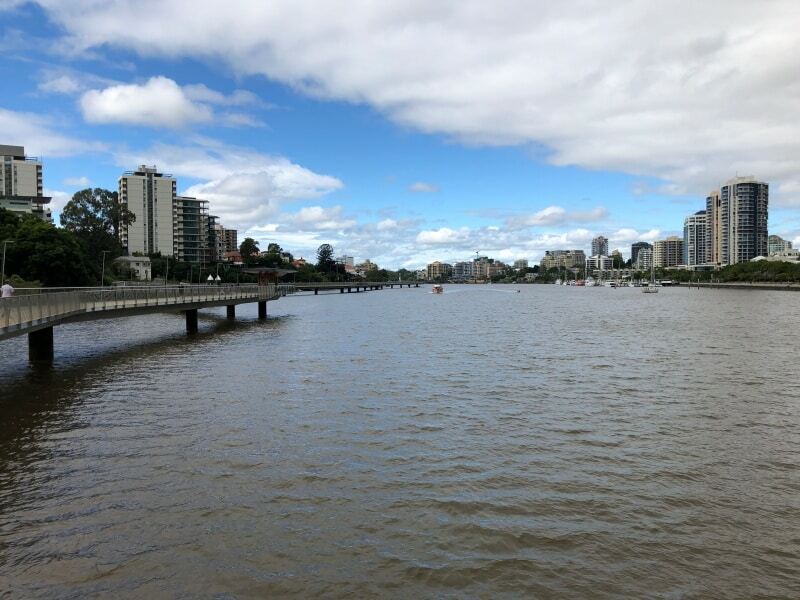 We headed from the Botanical Gardens down to the riverside and then proceeded to ride alongside the river all the way back towards New Farm Park, keeping one eye on the path and the other on the different parts of the city as we made our way through them. 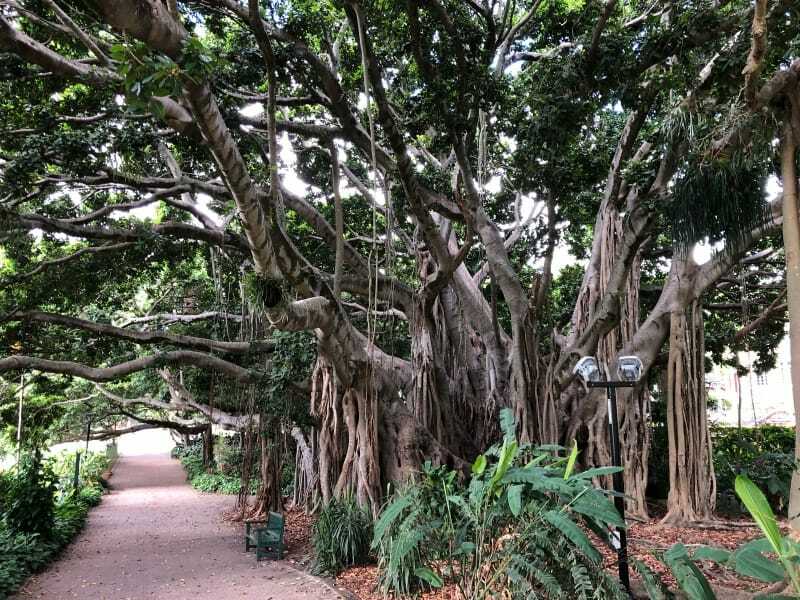 First of all was the Gardens themselves – an oasis in the CBD with 18 hectares of parkland which opened back in 1828. The track follows the bank of the river for 1.8km and then pops out to the CBD. A path between the river and the skyscrapers of the business district is shared between pedestrians and cyclists, but everyone seems to be sharing the space nicely, and nobody objects to the off ringing of the bell to let them know that you’re there. The CBD retreats as you hit the RiverWalk, which is a floating walkway over the river set out away from the bank to give a truly unique perspective on the city from river level. The houses which face onto the river have their own jetties and it’s fascinating seeing how the other half live – these are not cheap properties! Finally we ride through the same Merthyr Park where we’d been caught in the rain and it’s much nicer when you’re not concentrating on trying to keep under a tiny umbrella. We end up dropping off the bikes just after the Park, and then walking back to the Ferry stop to catch the City Hopper again to make our way back to the Hotel. 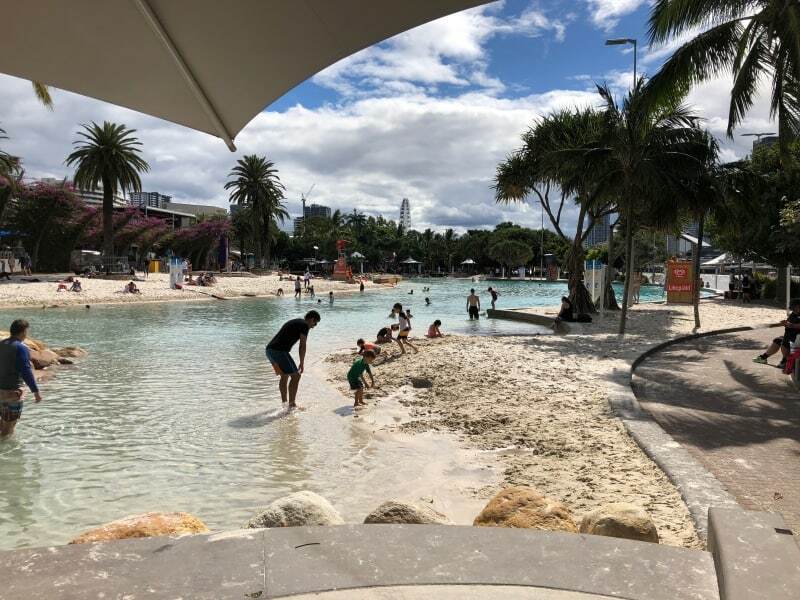 Ange wanted to see the City Beach, an artificial swimming environment on the South Bank beside the river, modeled on an Australian ocean beach. 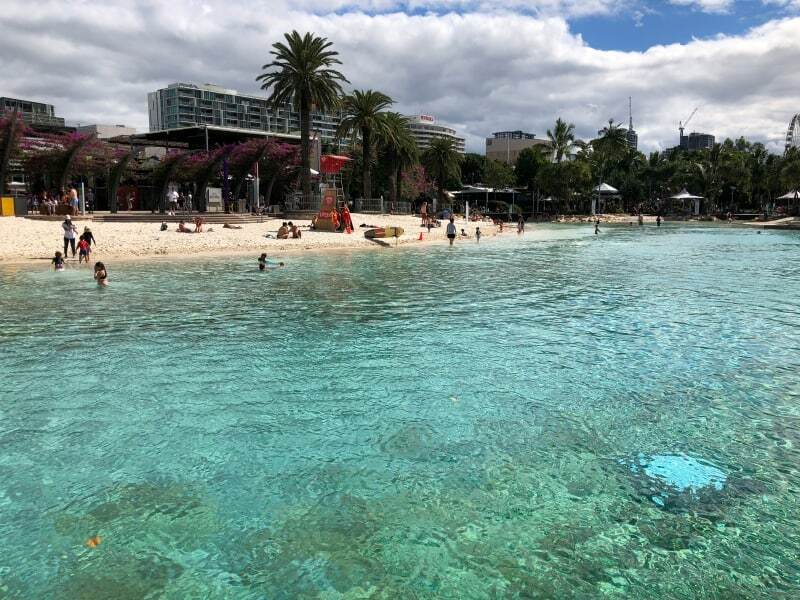 I must admit the juxtaposition of a man-made beach right beside a natural river did appeal, so we got off the City Hopper a little before our Hotel and travelled along the South Bank. There, nestled between the restaurants and the river, was an oasis of a swimming hole complete with life guards and sand. 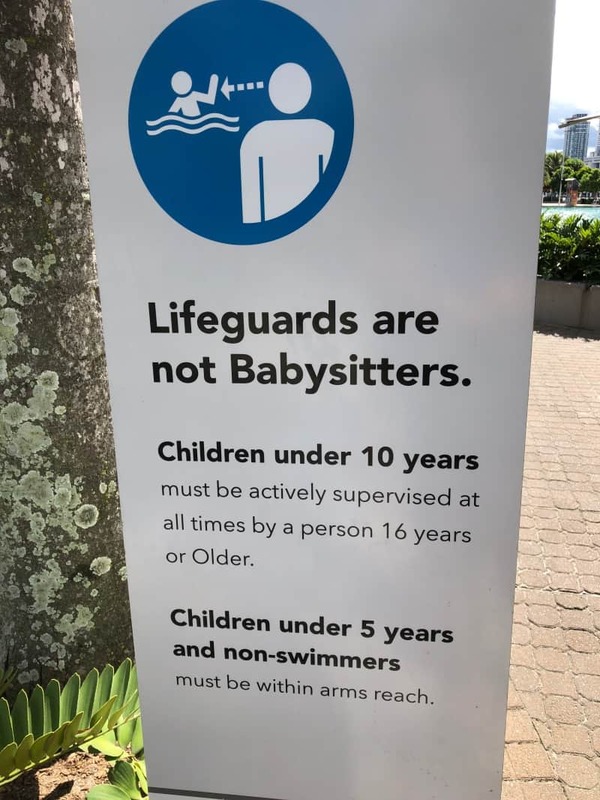 Signage let people know that the life-guards weren’t baby-sitters and some tourists were actually in the water. 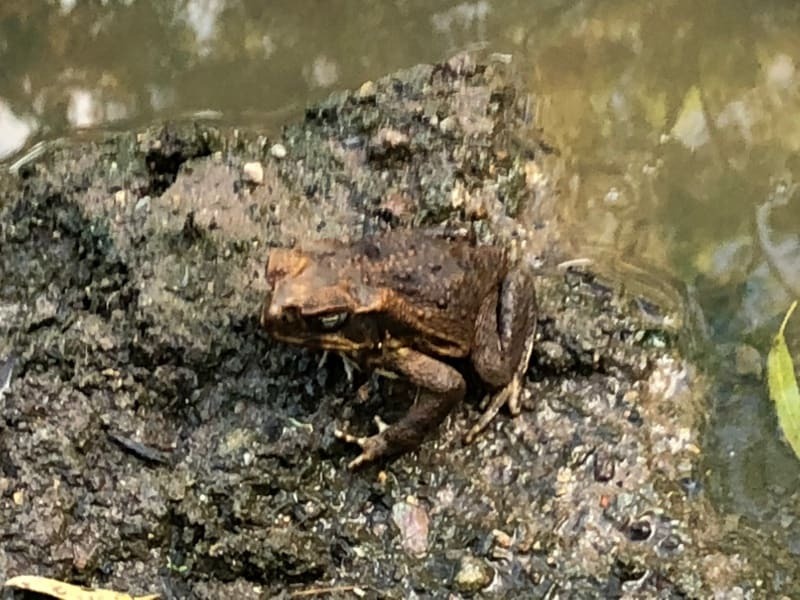 I could tell that they were tourists because although the temperature was in the mid twenties Celsius (~70°F) and therefore warm enough to swim, for local Brisbanites that would be way too cold. 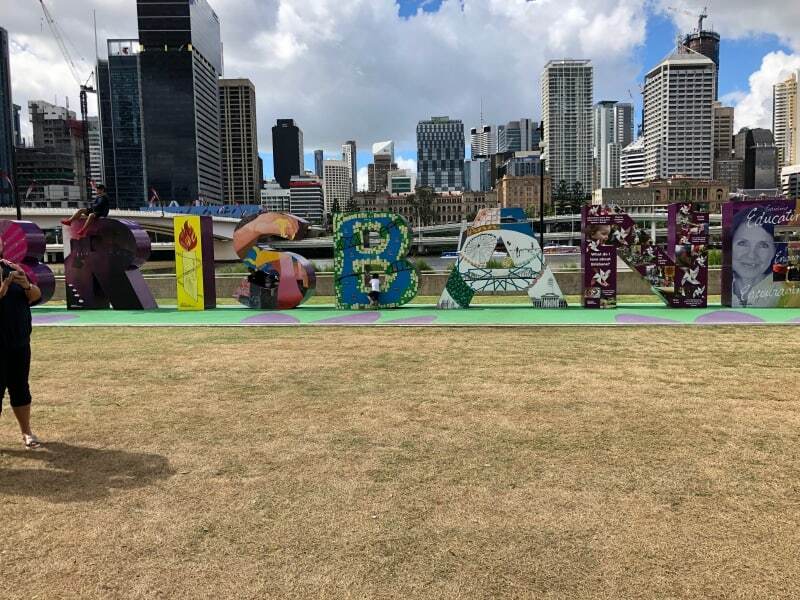 Further long the banks of the river were the letters spelling out Brisbane, painted in various different colours. Unfortunately this made the photos we took not very good as the letters failed to stand out against the background. 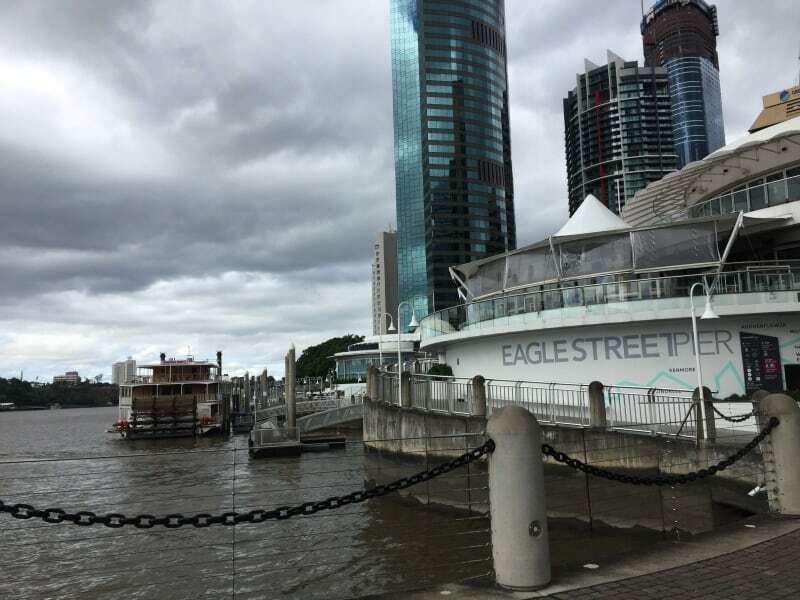 Ange tried to clamber on the “s” of Brisbane but again, it was hard to see her. Not quite as good as some of the other city letter statues around. Finally we came to the Victoria Bridge and headed to the monument to the right of it. 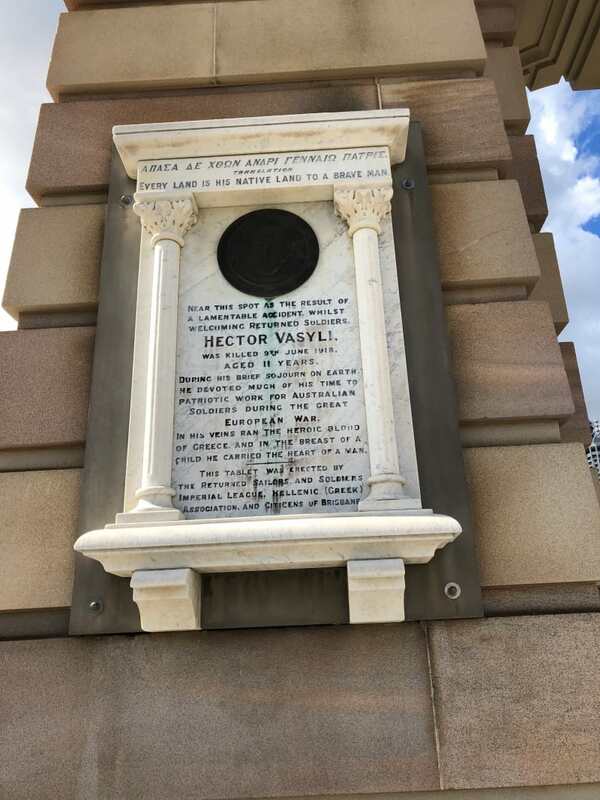 This turned out to be the remnants of the previous bridge that stood here, and serves as a permanent monument to an 11 year old boy, Hektor Vasyli, who was accidentally killed while welcoming the Australia soldiers home from World War 1. We crossed the bridge for the last time and then came across a parade. 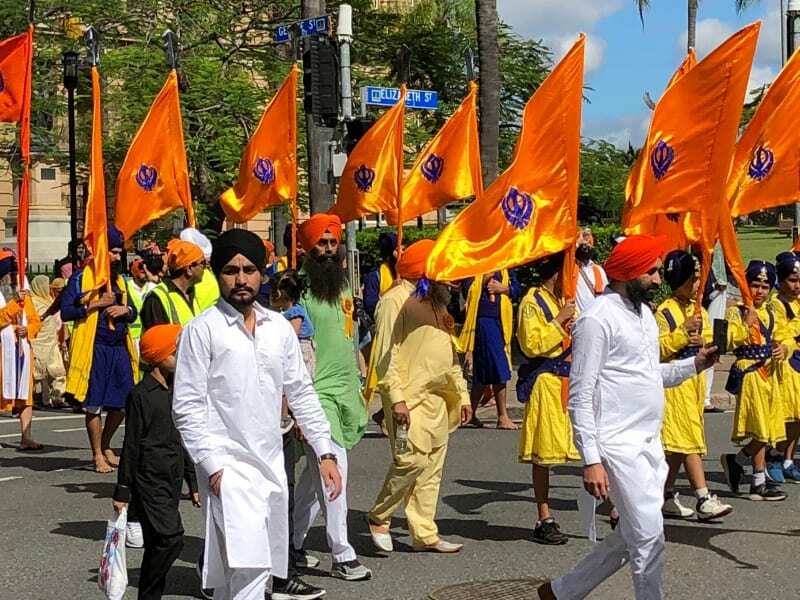 Hundreds of Sikhs were marching, accompanied by police, trucks and attendants handing out apples. The trucks held men sitting on the floor and singing into microphones and at the head of the parade, after the police car and pipe band were a line of elders in bare feet marching solemnly. Various members of the parade twirled some sort of plastic contraption and would fling them into the air before catching them and continuing their rapid rotation. 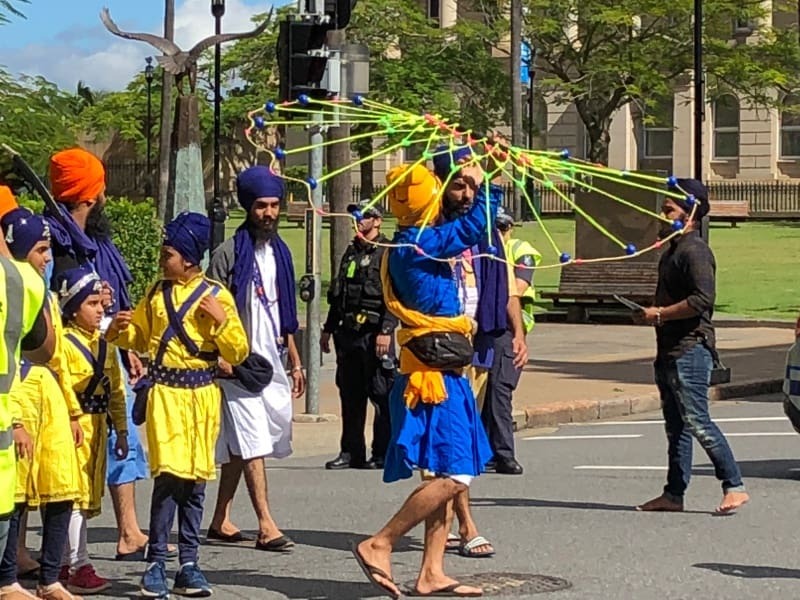 We find out later it is to celebrate Vaisakhi – the start of the Punjabi New Year and the anniversary of the year (1699) when Sikhism was born as a collective faith tradition. Ready to head back home, we got our luggage and got on the train to the airport. At the airport station we found a kiosk and got a refund for the remaining cash on our Go travel card, plus the deposit, and then caught our plane back home. 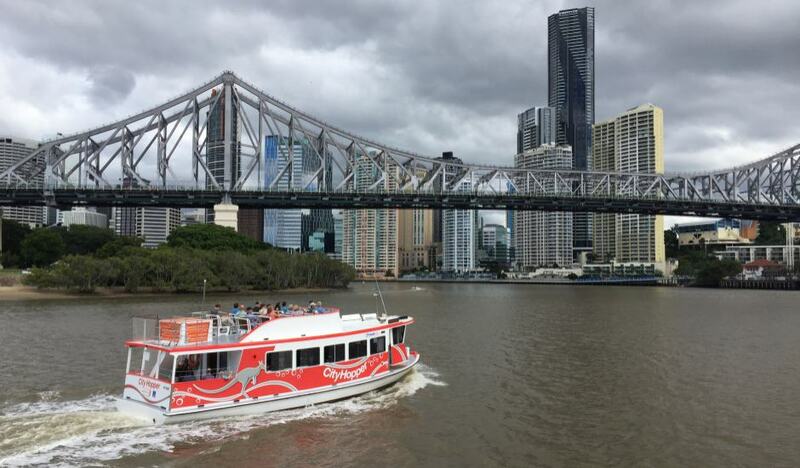 We hadn’t done a whole heap of touristy things, but we’d had a really good time in Brisbane.